UPDATE: Quantum Leap is is now closed. My sister came to visit for a weekend, and was game to try a new veggie burger with me even though she herself is not a vegetarian. Walking down 1st Ave, we were about to pass right by Quantum Leap (yes, like the tv show!) until I saw the large sign that said “veggie burgers”, and we immediately decided this would be the perfect place to grab a quick dinner. Quantum Leap’s menu features six different burgers to choose from, and although several of them sounded good, I picked the basic “grilled veggie burger” because it was described as “Our most popular burger” so I figured I couldn’t go wrong with that as a first impression of the restaurant. Molly ordered the baked lentil walnut burger, which would have been my second choice - so she agreed to let me have a bite for comparison. The food smelled great when our server brought it over to us. The burgers came not only with a side salad but also fries (I had chosen the garlic fries, which were delicious!). The first bite was, unfortunately, rather underwhelming. I had high hopes for a place that bragged about its veggie burgers, but this was nothing mind-blowing. The patty was tasty enough, and filling, but I disliked the texture. It felt too much like it was trying to imitate the texture of meat, and sacrificing real quality to do so. It reminded me of the standard frozen imitation hamburger patties that I’ve had in the past. I was honestly unsure whether it was a pre-made patty like those, or if it was custom-made by the restaurant. The toppings were good though – grilled onions and green bell peppers (and mushrooms, which I dislike, but I just picked them off before I took a bite). The bun looked and tasted like it came out of a plastic bag from the grocery store’s bread aisle. Not terrible, but disappointing since I usually expect a restaurant to serve me something better than what I can just pick up at my local Key Food. On the other hand, while my sister’s lentil walnut burger was served on the same lackluster bun, the texture was phenomenally better. It really felt and tasted handmade, although I preferred the flavor of mine… if there was a way to merge the two of them, it would have been a much better burger (the lentil walnut burger also did not come with any toppings, and I think it would have greatly benefitted from the same grilled onions and peppers that were atop my burger). 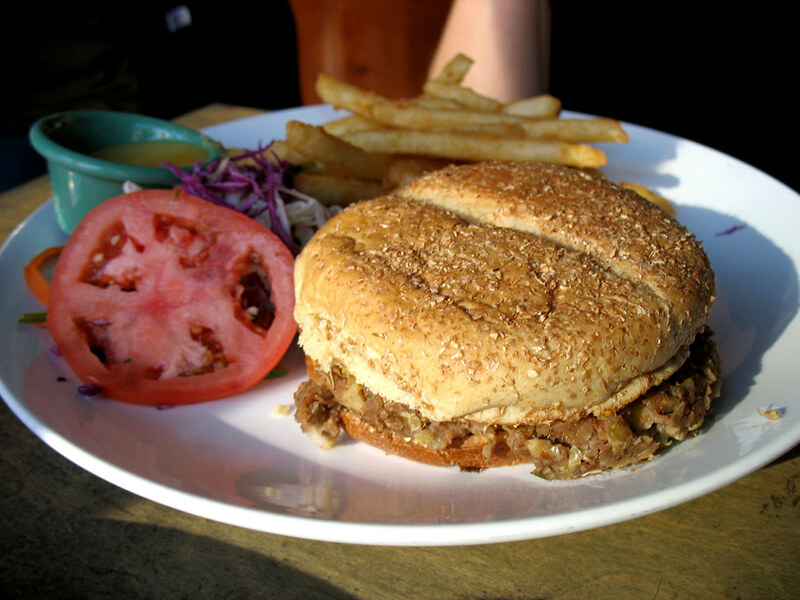 Overall, it was tasty and satisfying – but not special enough that I would return again, given the numerous other superior veggie burger options just a few blocks away. 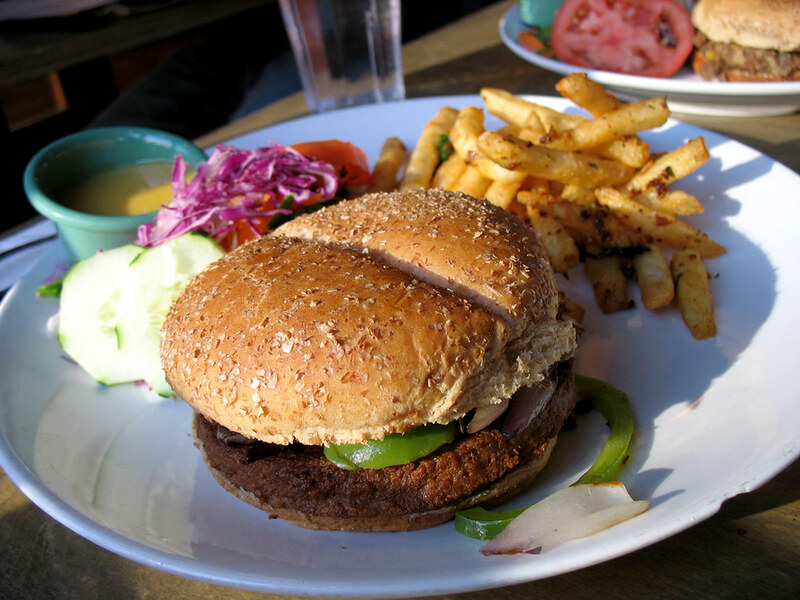 The lentil-walnut burger is vegan, and the grilled veggie burger contains eggs but no dairy.